Tricia Smith, Olympic medallist and past chair of alumni UBC, is now president of the Canadian Olympic Committee. Internal controversy and an out-of-control international doping scandal has put the purity of the Olympic movement in question, but Smith still sees amateur athletics as transformative and is a strong believer in Olympic values. Before leaving for Rio, she spoke with Trek magazine. When Tricia Smith was appointed president of the Canadian Olympic Committee (COC) in 2015, she was handed a major controversy. Allegations of harassment – sexual and otherwise – had crippled the organization, compromised its values, and created a toxic atmosphere for employees and athletes alike. In order to prepare for the Summer Olympics in Rio, it was essential that she attack the issues quickly and efficiently if the Canadian team was to find any success at all. It points to Smith’s strengths as a leader, negotiator and diplomat that she was able to establish a positive path to healing in short order. Rather than point fingers and let charges fly, she opted instead to look inside the organization and fix it from within. She and her team conducted extensive interviews with staff members, guaranteeing their anonymity, to get a true sense of the extent of the toxicity, then set out procedures to eliminate it. The team, which included an outside consultant, came up with eight recommendations, all of which were implemented. They included an anonymous whistleblower mechanism, leadership training for staff to improve the employee experience, and a transparent method to resolve disputes. As Smith says, the atmosphere in the organization did not in any way reflect the ideals or the attitudes of the Olympic movement. “It wasn’t who we are. The process isn’t complete yet but we’re well on the way to creating an even stronger organization that reflects Olympic values.” And a strong organization is what’s needed for the Rio games. Deputy Manager and Principal, Barnescraig & Assocs. Launching a group of athletes for the Games takes a huge effort on the part of the COC, Sport Canada, Own the Podium (OTP) and National Sport Federations (NSFs). The COC is responsible for getting the team to Rio, which includes preparing 740 team kits for athletes and support staff, opening and staffing Canada Olympic House, establishing security protocols, supporting the team in the village and keeping tabs on the conditions of the various venues. And though Rio has had its problems with questionable water conditions and unfinished facilities, Smith is confident the sites will be ready. “There are always concerns about venues not being ready,” she says. “In Sochi, I woke up my first morning in the Olympic team hotel in the mountains to find little piles of gyproc beside my bed. But things always seem to get done on time. I’m not worried about Rio.” Still, the problems accompanying this year’s Games — including the threat of terrorism, political upheaval, Zika-bearing mosquitoes, and the ban on Russian athletes amid revelations of state-sponsored use of performance enhancing drugs — are among the most difficult in Olympic history and may come to define the Rio experience. Canada has done well in summer Olympics considering our size and climate, but there’s always the desire to do better. Part of the function of the Canadian Olympic Committee, and of Smith as president, is to work with the NSFs, OTP, Sport Canada and other provincial organizations to build amateur sports in Canada. Athletes’ development, at least at the elite level, is managed by the NSFs and mostly funded by Sport Canada and the COC, both of which funnel their elite sport funding through Own the Podium, which employs technical experts who determine how best to use the funds. Good coaching is also extremely important, and the COC is involved in supporting local talent as well as sourcing and hiring new coaches from abroad. It’s also essential to develop new facilities. Rowing has the highest all-time UBC representation of all sports; 73 UBC athletes have brought home 45 medals in rowing. Smith says, “One of the reasons communities bid for games, including the Pan Am Games and the Olympics is to develop new facilities and training opportunities for our athletes.” It’s also, presumably, to promote those Olympic values in host countries. What these values are in an era of vast commercialization, corruption in senior sports organizations and political controversies is currently under question. The Olympic movement has, traditionally, focussed on the inspirational value of amateur sports, of the ability of a talented athlete from any country to overcome huge obstacles, train tirelessly and aim for a spot on the podium representing their country and their sport. Even qualifying for the Olympics is a major achievement and a source of life-long pride. Perhaps even more important is the hope that the Olympic movement will act as a bonding agent for nations that might otherwise be at odds with each other: sport overcoming politics. Those values have come under even harsher scrutiny with revelations about doping in sports in general, but in the Olympics in particular, and much of the work undertaken by the COC and other amateur sports organizations in Canada, and around the world for that matter, is to fight doping and protect clean athletes. Revelations about Russia’s systematic performance enhancement drug (PED) use policy has shaken the international amateur sports community. The World Anti-Doping Agency (WADA) has established stringent guidelines for the detection of banned substances, and each nation is responsible for setting up and maintaining drug testing for its athletes. Of course, some nations are more diligent than others in applying these rules, and revelations about Russia’s systematic performance enhancement drug (PED) use policy has shaken the international amateur sports community. If a huge competitor like Russia can operate state-sponsored doping of its athletes, what hope do smaller, more transparent nations have of competing fairly on the world stage? In spite of rampant and, some would say, ultimately ungovernable PED use by athletes in virtually every sport, amateur or professional, some headway is being made to combat its growth. The science of detection, however, seems always to be a step or two behind the science of PED development. The current revelations of positive tests, however, are a result of the relatively new practice of saving samples from tested athletes for a 10-year period, during which time those samples can be tested with new detection methods as they are developed. Recently, retrospective testing of athletes from the 2012 London Games uncovered an additional 23 offending participants, and an additional 31 new positives from the 2008 Beijing Games. As well, out-of-competition testing protocols have been established and applied worldwide, whereby athletes can be tested during lead-ups to events when they would most likely be doping. Individual countries are generally responsible for administering tests on their own athletes, and if they don’t report testing as required, the country can be considered non-compliant and be penalized. Tricia Smith competed in rowing during the era when East German athletes were suspected of using PEDs, and saw doping on the ground. It was thought that many of the athletes from some Eastern European countries were using these enhancers, but few were ever caught. It wasn’t until the fall of the Berlin Wall, when secret records were made public, that the East German doping program was confirmed. Smith and her teammate, Betty Craig, won Silver in the Coxless Pairs event during the 1984 Olympics, losing gold to the Romanians. While there was no proof that the winning pair was using PEDs, Communist-era Romania was notorious for using enhancements in other sports. 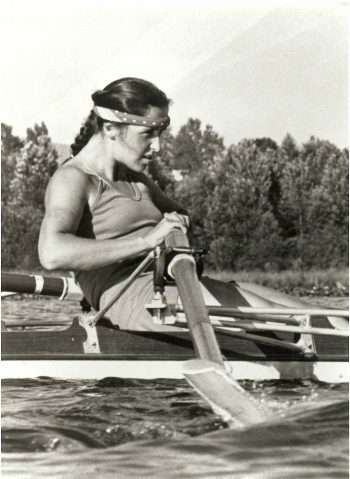 Tricia Smith competed in rowing during the era when East German athletes were suspected of using Performance Enhancing Drugs. Smith says since there was never any proof the Romanians or the East Germans cheated at the time, they did not dwell on suspicions. “We were disappointed not to win Gold, but the experiences I had in sport were amazing. I’d do it again in a second. There were many races in which we beat the East Germans and others who we now know may have been cheating. Overall we had great careers. “There will always be people who try to gain some advantage through drugs or other means,” she says. “The majority of athletes are clean, and we’re putting a lot of effort in to protecting them and making sure those who cheat get caught. When people ask me about all the doping cases lately, I say ‘isn’t it great that we’re catching them?’” That, and the 10-year sample storage, she feels, will give pause to those who might be tempted to use PEDs. But things have changed over the last hundred years. Better training methods, enlightened nutritional ideas, great strides in health care and even a better understanding of sports psychology have all contributed to athletes being much stronger than those of even a few decades ago. So why not let athletes do whatever they can to improve their performance? Why not develop performance-products that won’t harm the body, but that can show the outer limits of athletic endeavour? Tricia Smith firmly believes in the value of sport, in the process of training young athletes, and in helping them to compete at the highest levels. She has seen the benefits of such experiences in her own life and in the lives of athletes – and of communities – all over the world. A record twenty-nine current and former UBC student athletes are part of Team Canada’s roster for Rio, while another 17 members of the UBC community will be in Brazil as coaches, management, support staff, and medical and paramedical personnel for Team Canada and the Canadian Olympic Committee. In July, a send-off event was held at the Doug Mitchell Thunderbird Sports Centre. Images: copyright UBC Athletics.